Let me make it easy for you. Today, I will start with the very, very basics. STEP 1: Sign up for a Gmail email account if you don't have one. Click here to sign up for a Google Gmail account. A single user name and passwords gets you into everything Google. If you already have a gmail account, figure out the password you have forgotten or reset it. If you haven't forgotten the password, great job! Go to Step 2. STEP 2: Once your account is set up, go to Google.com. Your screen should look like this. ...is how you will access everything. To open up Google+, click on the +our name) button. Your home page in Google+ will come up. Once you start following people and adding people to your circles, you will see the posts that those people have made here. Notice, there is also "More" at the bottom. Google Wallet, shopping, finance, photos, books, and more are there. From this menu, you can access most of the things you need in your life that don't breathe. The other button that looks like the bell is your notifier button. If it has a red number on it like this someone has reshared, +1'd, commented or added you to a circle. If you have turned the notifiers on in the communities you join, then you will also get a notification if someone posts in that community. Click on the bell and it will open all of your activity. Click on each one and +1, reshare or comment back to them. 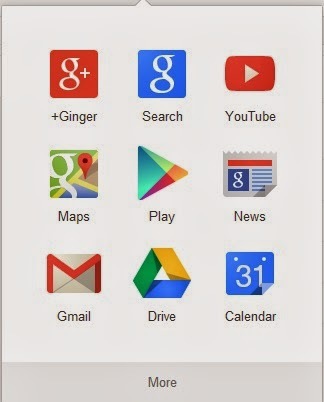 On the left hand side of the Google+ home page you will see a button that looks like this. This is where you can set access your profile to make changes, find people, look at photos, join communities schedule events, join hangouts and create pages, which are like FB pages only they do more. We will explore that further in a separate lesson. STEP 3. Play around. Now, you know how to get to everything, so this should get you started. The best way to learn is to get in there and just play around. p.s. if you enjoyed this blog, please click on the +1 button just below here, so that others may enjoy it, too!